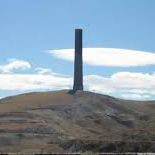 This giant chimney holds two titles: it is the largest free-standing masonry structure on earth, and the highest chimney on earth. Constructed in 1918, it is all that remains of the once largest nonferrous copper smelter in the world. It’s outside diameter is 86 feet at the base and 75 feet inside. It tapers to 60 feet wide at the top. It is 585 feet tall and was constructed with 2,464,672 acid-resistant blocks (equal to 6,672,214 ordinary bricks), and weighs 23,810 tons. To place the blocks required 41,350 sacks of cement, 77 cars of sand (50 tons a car) and 37 cars of fire clay. The base was created with 20,891 sacks of cement, 50 cars of sand, 118 cars of crushed rock, and 5,100 cubic yards of concrete. Construction took 142 actual eight-hour shifts with 12 bricklayers a shift. The workers used 305,000 board feet of lumber. It is large enough to hide the Washington Monument inside its massive structure. There is no direct access to the stack, but you won’t miss seeing it from the road.